Abstract: This article is intended to deal with creating Virtual Private Networks (VPNs) to connect a home network with the outside world. The Internet can be a dangerous place for your information. Sure, you are only one of hundreds of millions of users online at any given time, so why would your particular data be in any danger? Well, why not? Take this analogy for example. I could leave the windows open in my house when I leave for work every day, and for years nothing could happen. One day though, someone may choose to enter through that open window and I might just get burned. Nice analogy, that windows idea actually... given the easy availability of freeware software that can capture internet bound traffic on both wired and wireless networks, the idea that someone may at this very moment be sniffing around your Windows installation to see what they can get is not as remote as we'd all like to think. This article is intended to deal with creating Virtual Private Networks (VPNs) to connect a home network with the outside world. In the course of this slightly more advanced PCstats guide we will discuss the nature of VPNs, the dangers of the Internet, and the encryption methods involved in securing yourself from them. It is assumed that you have a basic knowledge of the meaning behind networking terms such as IP addresses, Local and wide area networks, firewalls, etc. If you are looking for a primer on basic networking concepts, please see the following PCstats Guides first; Home Networking and File Sharing, Internet Connection Sharing, Remote Access to Computers..
At it's simplest, a Virtual Private Network, or VPN, is an extension of a given private network (say your home network) that uses public network space (the internet) to allow remote users or networks to connect. A VPN incorporates two features, encryption and tunneling , to ensure that the data is delivered safely and privately across the public space. VPN technology arose from the need to reduce the cost of secure communications between large corporate computer networks. 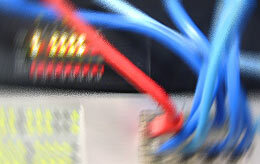 Dedicated connections (leased lines) such as ISDN or T1's between networks are incredibly expensive for a business to maintain. By taking advantage of public network space (the internet as you and I know it) to carry communications, the cost could be reduced greatly. A point-to-point line is expensive, but on the other hand you don't need to worry greatly about someone listening in between point A and point B. In contrast, sending data from point to point over the internet is much more economical, but as the data will travel over many different public networks, it is at risk if not secured. This is where encryption and tunneling come into play. With the increasing use of the Internet as an efficient medium for carrying information, encryption has come into its own. For example, if you were transferring data across a public network, you would want to at least make sure that the data is sufficiently encoded as to make it unreadable to the casual eavesdropper. The basic principal behind most computer data encryption methods revolves around each computer participating in the transfer of encrypted data having a numerical value (key), that key is then used to encode the data it sends over the network wires into a meaningless collection of characters. Depending on the method of encryption used, this key will either be agreed on with the remote computer before the data is sent and then used by both computers to encrypt and decrypt the data. Or, one computer's key will be used to encode data only for another separate key value to decode, and vice versa. There are many methods of encryption currently in use, some of which we will refer back to later in the article when we begin using VPNs. Suffice to say for now that the purpose of encryption is to make data secure by rendering it useless to any unintended recipient. That is all well and good, but what about VPN tunneling?